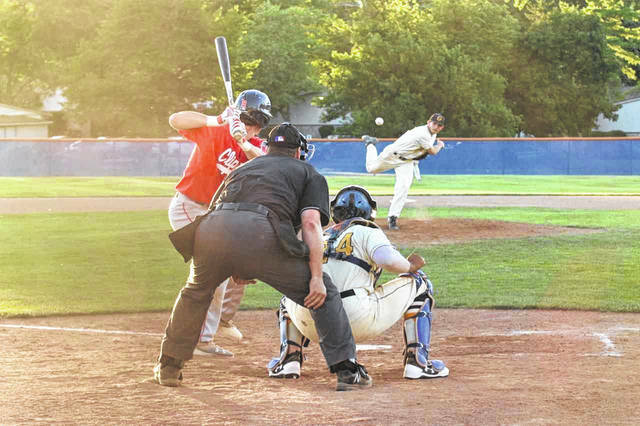 GALION — After the Galion Graders snapped their seven-game losing streak with a doubleheader sweep of the visiting Richmond Jazz on Friday, they were back at it again on Saturday for the first of two weekend meetings with the Muskegon Clippers on Avita Day at Heddleson Field. From the very first pitch, the Clippers offense showed that they meant business, putting up five runs on only three hits in the top of the first. Muskegon would never look back during Saturday’s contest and went on to rout the hosting Graders; 10-1. All of the visitor’s scoring was done in the first five innings of the game. After the five-run first, the Clippers plated a run in the second, third and fourth innings before hanging a two-spot in the fifth. Muskegon would finish the contest with 12 hits en route to the 11 runs, despite stranding 11 runners on base throughout the game. Galion would post 11 hits of their own but only managed the one run as they stranded eight in the contest. The big factor in determining Saturday’s game was the errors committed by the hosts. The Graders would commit five errors in the field while the Clippers finished with just one miscue. 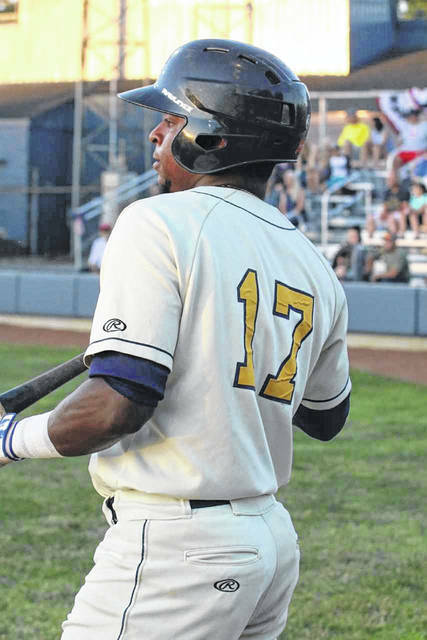 Juan De La Cruz reached on a one-out single in the fourth and would make his way to second base after the lone Clippers error by their left fielder, Nolan Brimbury. With De La Cruz now in scoring position, Michael Rodriquez would groundout to shortstop James Roche and move De La Cruz to third. 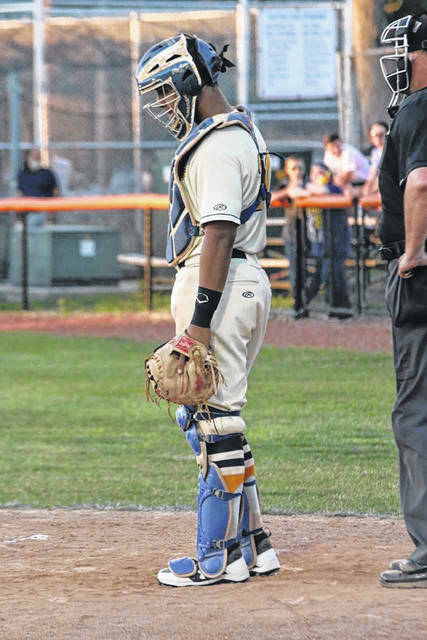 With two down in the frame, Christopher Jordan stepped in and delivered the lone RBI for the Graders as his single brought Juan across for Galion’s only run of the ballgame. In a strange move in the bottom of the fifth inning, the Graders skipper Neil Schaffner moved their stand-in first base coach, Bailey Durocher, a pitcher by trait, into the ballgame to play first base. That meant that Vince Donato would move out to right field from first, sending Austin Hathaway to center. Todd Sekowski moved from center field into the infield at second base. Rodriquez slid over to shortstop from second and starting shortstop Jordan took the mound as a relief pitcher for Galion. Jordan would proceed to work the final five innings for the home team and fared well, allowing six hits and two runs (one earned) while walking one and striking out four. Offensive stats from Saturday’s loss were: Team- 11/33, R, RBI, 2BB, 4K, 8LOB; Hathaway- 1B; Seamus Kenneally- 1B; Jacob Reimold- 1B; Juan De La Cruz- 2-1B, R; Rodriquez- 2-1B; Jordan- 1B, RBI; Donato- 2-1B and Durocher- 1B. Clayton Cooper got the nod as the starter for Galion and struggled early with his command. Cooper lasted just one inning and departed with an apparent arm injury. In his time on the hill, Cooper gave up three hits and six runs (three earned) while walking three and striking out just one in the loss. Nick Smith came on in relief and pitched three innings, giving up three hits, two runs (one earned) while walking one and fanning three. GALION — The Graders and Clippers would meet again on Sunday evening with Galion looking to get back to winning form after the brief hiccup in Saturday’s meeting. Galion would get back to an even .500 on the season at 12-12 by defeating Muskegon by a final tally of 8-6. With the loss, the Clippers also moved to .500 at 13-13. 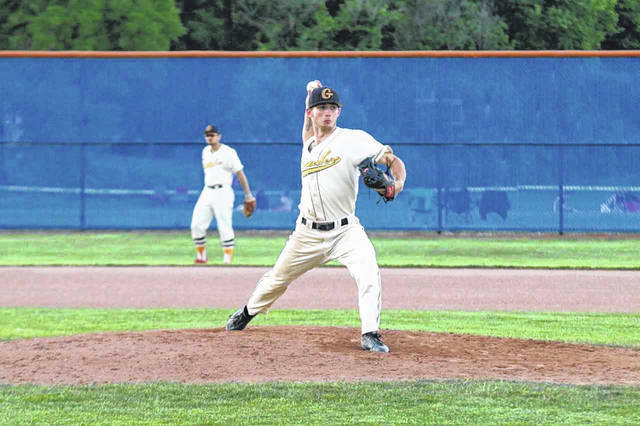 Gaetan Sinisgalli took the ball for the start for the Graders and worked seven innings while giving up seven hits and six earned runs. Sinisgalli went on to walk just a pair of Clippers’ batters on the evening while striking out eight. Mac Spears finished the game off for the two-inning save, scattering three hits and walking one. In Sunday’s match-up, it would be the home team striking first, plating three runs in the bottom of the first after holding their visitors scoreless. Kenneally got the rally going with a one-out single and moved over to second after Sekowski was plunked by a pitch. Both Kenneally and Sekowski would find themselves closer to home plate after a pass ball put them at third and second, respectively. Reimold proceeded to drive Kenneally in on a single with Sekowski moving up to third before scoring on an RBI double by De La Cruz. With Reimold on third, Donato delivered Galion’s third run of the inning on a single. However, De La Cruz would be left on third and Donato on first as the inning came to a close. Neither team could find the offense in the second inning and the Clippers would also go quietly in the third to send up the Graders, still leading 3-0. Reimold would record his second hit of the contest before scoring on another double by De La Cruz to put the home team up 4-0 heading into the fourth. In that fourth, Muskegon was hushed again and Galion would hang up another run thanks to a walk drawn by Cole Andrews that would eventually lead to the Graders fifth run via a wild pitch. Muskegon was finally able to get something going in the fifth, beginning with a ground rule double by Brimbury, a single by Jack Butler and a walk issued to Nolan Bryant to load the bases with nobody out. The Clippers managed just one more hit in the ideal situation, leading to two runs to cut into the Graders’ lead; 5-2. Galion, however, would have themselves a successful fifth inning as well. Thanks to three singles, some intelligent base running and a Muskegon error, the Graders were able to add three additional runs to the scoreboard to give themselves a cushion heading into the sixth at 8-2. The Clippers refused to go down without a fight though, scoring four runs in the top of the sixth via three hits, including a two-run home run by Bryant to put the game at its eventual final score of 8-6. Muskegon tallied just two more hits in the seventh through ninth innings, stranding a total of six base runners in the process. Galion would not have a hit in their remaining at bats but were able to hold on on defense to capture the victory. Offensive stats for the Graders on Sunday were: Team- 9/32, 8R, 7RBI, SB, 2BB, 4K, 4LOB; Kenneally- 1B, R; Sekowski- 1B, 2R, SB; Reimold- 3-1B, 3R, RBI; De La Cruz- 2-2B, 3RBI, R; Rodriquez- 1B, RBI; Donato- 1B, 2RBI and Andrews- R.
Galion will continue their eight-game home stand on Tuesday evening as they welcome the St. Clair Green Giants to town for two games in two days. On Thursday, July 12 and Friday, July 13, the Irish Hills Leprechauns will head to Heddleson to meet up with the Graders. Over the weekend, Galion will be back on the road when they travel to Xenia for a pair of games against the Scouts on Saturday and Sunday before the All-Star break.